The sanctions applied by the European Union and the United States against Russia in retaliation for its annexation of Crimea might seem relatively mild, but they are a sign of deteriorating confidence in Russia as an economic partner, which in the longer term could progressively undermine the Russian economy. This in turn raises the question of a global spillover from a potential Russian crisis through real-economy channels. First: Despite Russia’s economic rank, it generates slightly less than 3 percent of global economic output, at approximately US$ 2000 billion. Russia thus poses a limited systemic threat. Second: Russia is relatively well integrated into international trade flows. Imports and exports of goods correspond to slightly more than 40 percent of GDP (compared to trade-intensity in Germany: 75 percent, and in the US: 25 percent). However, Russia plays the smallest role of all WTO/OECD countries in global value chains. While in Germany the value of exported goods is up to 30 percent of imported intermediate products, in Russia it is less than 10 percent. Only in Russia’s automotive industry is this ratio up to 20 percent. Hence, an economic crisis in Russia would have little impact on foreign suppliers – there are hardly any. Third: An economic crisis in Russia would have little impact on the country’s exports. 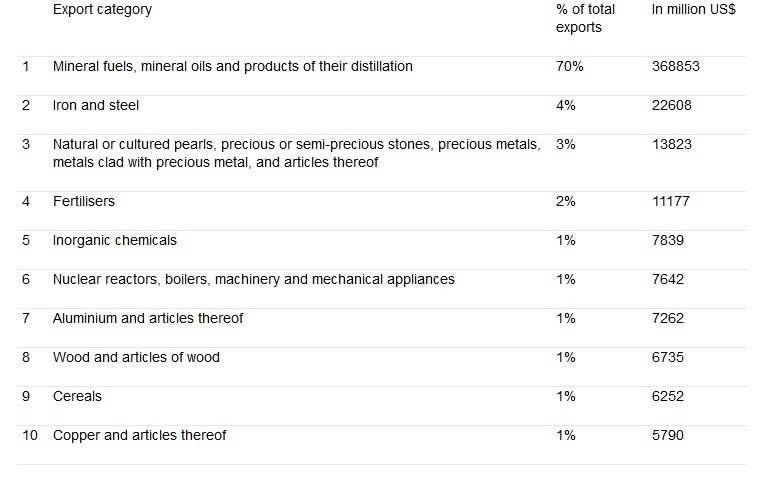 Russian foreign trade is heavily biased towards energy, raw materials and agricultural commodities . In terms of value, the greatest share of Russia’s exported goods is indistinguishable from corresponding foreign products. Other countries could step into any breach created by a decline in Russian exports. Depending on the depth of the decline, however, there would be an impact on world market prices (see my blogpost on replacing natural gas exports). Nevertheless, a major decline in energy and commodity exports in particular is not expected because continued use of the existing and very profitable plants is likely even in the case of a severe economic crisis. Only in arms exports might the main importers, such as Venezuela, Syria and Algeria, find it hard to replace Russian goods. Fourth: Russia’s huge revenues from energy exports allow it to act as a major buyer on global markets. In 2012, Russia imported goods amounting to US$ 300 billion – the GDP of Denmark. But Russia is a pick-and-mix purchaser. 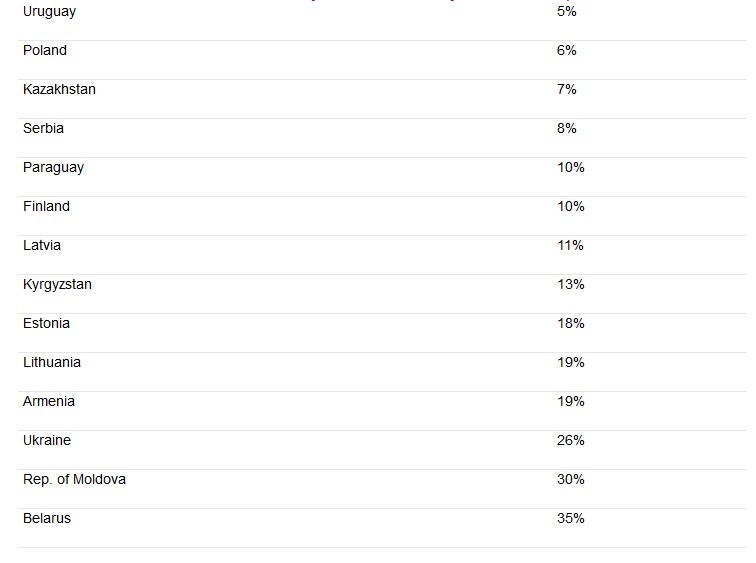 Few countries sell more than one-twentieth of their exports to Russia. These are – in addition to nine former Soviet republics – Poland, Serbia, Finland, Uruguay and Paraguay. In addition to these countries that would be directly affected by reduced exports to Russia, there could be second-round effects – countries selling goods to the countries that export more than 5 percent to Russia might also be affected. Fifth and finally, foreign firms in Russia might lose (a part of) their business there. There are many prominent and visible examples of foreign investors ranging from the Carlsberg brewery to Volkswagen (see stories in the FT and the Spiegel). But one has to put these exposures into context. Russia has been much less able to attract foreign direct investment than other countries of its size. For 2012 the OECD reported that the stock of foreign direct investment to Russia amounted to US$ 137 billion. This is about a third of what Brazil was able to attract (US$ 354 billion) and about the same level as Poland (US$ 118 billion). A post-Crimea Russian economic crisis is hardly desirable, not least because of the internal instability that it might provoke. But it would be unlikely to have substantial direct spillovers onto trading partners. Shock-transmission through the financial sector is another concern discussed by Silvia Merler in a previous blogpost. Assistance by Olga Tschekassin is gratefully acknowledged.